Generally, when Time is discussed in philosophy or in science—including the works of classical Jewish philosophers—it is understood as movement, or change. The movement of the planets, the ticking of a clock—as long as these things occur, there is Time. If they cease, Time also ceases. In other words, Time is no more than the occurrence of physical events. In this paradigm, once we accept the creation of heaven and earth ex nihilo, it is a simple conclusion that Time began then as well—since Time is no more than the events of the cosmos. The fact that we cannot fathom an absence of Time is irrelevant. After all, neither can we fathom an absence of heaven and earth—in other words, of space and matter. In this way Maimonides and most of the classic Jewish philosophers determine, contrary to the opinion of Aristotle, that Time is a creation with a beginning. All science deals with the measurement of things.2 Indeed, it is a wondrous aspect of our universe that by measuring its phenomena we are able to calculate with some accuracy their outcomes. But there are several limitations to this ability of ours. Of course, there are the subjective limitations: the precision of the tools of measurement, the form of measurement chosen, and even the consciousness of the subject who is measuring. Measurement is not really telling us directly about the phenomena we are measuring, but about the tools of measurement and our own relationship to them. But, most profoundly, even once we have all the measurements of any particular object, we still have not grasped that object itself. In other words, we can absorb and process information about the object, but our knowledge and the actual object remain distinct entities.3 Our measurements provide us with a working model to make limited predictions, but the only true model is the thing itself. Just as any object is not known in its essence by its measurement, so too with Time. Knowledge of change, movements, events—these are all measurements of Time. We could go even further: they are measurements of how things behave within Time. Time itself—Essential Time—is the parameter in which those events occur. 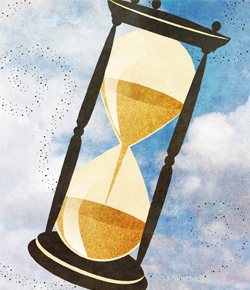 The question can then arise: Is Time of G‑d’s essence? In other words: is Time an absolute given, like G‑d Himself, in which a universe occurs? Or is Time just another creation, as are space and matter? The implications of this view are profound. In general, when the Jewish medieval philosophers wish to logically demonstrate that the universe began, they point to its essentially temporal nature. Everything is decaying, all systems work towards their own demise—therefore all things must have a beginning, or else they would have met their demise in the infinite past. This is similar to our concept of entropy and the current models of a temporally finite universe. But in this paradigm, there is a question left over: What about those things that do not wither with time? Has the Pythagorean Theorem lost veracity since Pythagoras? Do Newton’s Laws of Motion weaken over time? Is the accumulative principle that 1 + 1 = 2 gradually decaying through use? If the answer is no, then the question arises: are these things eternal? Are they the necessary “ground of reality” like G‑d Himself? But just what is this “Essential Continuum of Time”? As we stated above, Torah, being neither an empirical science nor an intuitive philosophy, but rather a received tradition of divine wisdom, is able to discuss the essences of things. The field of Torah known as the Kabbalah provides insight into the essence of our physical universe by discussing how it exists in a far more abstract form in a hierarchy of higher worlds. Each higher plane of world has an increased affinity to the initial point of Creation, and so things exist there in a more essential form. Time, as well, begins not as we know it in the physical world, but as an abstraction in the higher worlds. Essentially, it is “Order” (or “Sequence” or “Hierarchy”—in Hebrew, seder)—the concept that one thing comes in consequence of another. This is the form of Time to which Rabbi Yehudah ben Rabbi Simon refers when he asserts that “temporal order (seder zemanim) existed before Creation.”7 The many worlds that Rabbi Abbahu says were “created and destroyed” before ours8 existed in this form of Time—an entirely abstract form, which does not infringe even to a nanosecond upon physical time. It’s worth emphasizing that although we say that this form of Time preceded creation of the physical world, its precedent is not in terms of physical time that has any form of measurement—just as we have no form of measurement of any of the higher worlds or the phenomena within them. Furthermore, this form of Time is also a creation, just as is all else within the higher cosmos. It precedes the creation of the physical world, but is not primal in an absolute sense. That is to say, the very concept of precedent and antecedent is a creation. Time is also described in Chassidism as the flux of ratzo v’shov—a continual positive/negative oscillation of creative energy that drives all phenomena of the cosmos. Just as hearts beat, lungs inhale and exhale, energy pulsates in waves, particles vacillate between negative and positive states, so too the very substance of the cosmos continually oscillates between a state of being and not-being. This oscillation, as well, “precedes” Time as we know it. The essential continuum of Time in our world is the eventual manifestation of this higher form. Why does creation necessitate ratzo v’shov? The standard explanation in Chassidism goes as follows: For anything to exist, two opposite processes are necessary. On the one hand, the object must be sustained by the will of its Creator. On the other, it must feel itself as a detached and distinct entity of its own. Ratzo v’shov is the artifact of this dynamic of conflict. In this way it is the glue, or intermediary, between the creative force and the created being. In the words of Rabbi Menachem Mendel of Lubavitch (the “Tzemach Tzedek,” 1789–1866), Time is the intermediary between the cosmic soul and space. Time is the process of being, as opposed to the content of being. Going yet deeper, Time must be understood not as the order of things, or as the flux of creative energy that generates a world, but as the basic concept that renders this possible. In other words: the order of things and the rhythm of existence is possible because there is such a concept as Time. They happen within Time, but they are not of its essence. What is that essence? Like any essence, it can be described only by the events that occur within it, but cannot be known directly. This leads to a fascinating and important point: When we say that Time begins, we do not mean that it is preceded by its absence. The absence of Time also implies a concept of Time (and perhaps this is what is meant by “Immeasurable Time”). Rather, we mean that both Time and the possibility (at least conceptually) of its absence originated in the six days of Creation. To couch this in theological terms: We do not say that for G‑d there is no time. Rather, we say that for G‑d, Time and Non-Time are parallel fictions, both of His making (just like existence and nonexistence). They are two sides of a single expression. As stated above, science is limited by its inherent reliance on measurement. The Rebbe points out that this limitation has real impact upon the accuracy of its theoretical conclusions, resulting in error and confusion. This is what the Rebbe writes in the above-cited letter concerning “those who work in the field of relativity.” They deal only with the first aspect of Time—the measurement of Time—“and consequently err, resulting in very strange conclusions.” What is significant about this statement is that it asserts that our phenomenological study of nature is complemented by our “inside knowledge.” Even more so, that inside knowledge is vital in resolving the data. According to what the Rebbe writes in this letter, the paradox is easily dismissed. Events may be (relatively) accelerated by motion, and this would affect our measurement of time, that is, subjective time. But not Time itself. Within the essential continuum of Time itself, both twins would age at an equivalent rate. In fact, the concept of Time as a universal constant is fundamental to the modern field of science known as cosmology. This field is based on the assumption that both space and time do not change regardless of the vantage point of the observer. That this appears inconsistent with Einstein’s Special Relativity is a well-known point of contention. A similar approach could be applied to current confusion concerning the time of the six days of Creation: Certainly, measured Time would be different at the outset of Creation. Aside from the lack of a human observer to make these measurements, until the entire physical universe is in place, the cosmos would not operate in a form similar to today. However, the duration of those days are equal to our days in terms of Absolute Time, which begins at the outset of Creation. This discussion on relative time and absolute time provides an excellent venue for discussion of a much larger issue: the necessity for an interface between physics and metaphysics. The Rebbe has demonstrated that science faces an impasse in developing a cosmology when relying on material empiricism alone. There is a need for “inside knowledge”—essentially, for the soul of the cosmos to speak for itself and reveal its true identity to Man. This is precisely our understanding of Torah, and most specifically, its esoteric teachings. On the other hand, revelation is also in need of rigorous science in order to provide tangible knowledge within the realm of common human experience. Without that tangibility, the mundane physical world and the world of the spirit remain alien to one another. In order to reach the times when “all flesh shall see” and the physical world itself will reveal its Maker, there must be a convergence of the received and empirical forms of knowledge. To Rabbi Abraham Hecht; published in Igrot Kodesh, vol. 2, letter 283. This excerpt also appears in Likkutei Sichot, vol. 10, p. 176, where it is dated to 1946. All scientific experiments that have been performed—including those concerning relativity—the basis and content of all them is measurement, devices for measuring and a person who measures and derives conclusions. Therefore, all the conclusions at which we arrive—whether they concern only the measurement of space, or also mass and light—all is concerned with the behavior of the measurement devices and the properties of the person and his capacity. The Rebbe’s note on Tanya, chapter 5, printed in R. Yehoshua Korf, Likkutei Biurim, p. 57. Likkutei Sichot, vol. 20, p. 333, fn. 79. See also Likkutei Sichot, vol. 17, pp. 59–60, and the references there. This is a common theme in many of the Lubavitcher Rebbe’s discourses. Likkutei Sichot, vol. 17, pp. 59ff. Likkutei Sichot, vol. 8, p. 50. See references in the above two sources. See Likkutei Sichot, vol. 11, pp. 319–320, where the Rebbe discusses a similar concept in Space and contrasts this to its analogy in Time. Several issues of Nature from the year 1973 feature letters debating this matter, sparked by Professor Herbert Dingle of the University of London. One resolution relies on the fact that the stationary twin has not left his inertial system. Others find this unsatisfactory within the context of Special Relativity. See also Mendel Sachs, “Antiscience Within Science,” B’or Ha’Torah 2 (1982): 53, first published in The Humanist, January–February 1978. For an independent, critical perspective of both special and general relativity from a contemporary perspective, see the article by Tom van Flandern in Physics Letters A, December 21, 1998. Also see Petr Beckmann, Einstein Plus Two, Golem Press. For some reason I keep assuming that the interface is common knowledge..maybe that's why I don't like this article, because it tells me I might be able to improve the world. The short form is: decision = existence. Decision requires information. Withholding information --> withholding decision = non existence even though time passes = quantum computing. Implications with relativity brought in are very, very interesting. There's a PBS space time video in the "relativity" playlist where time is explained as causality, and "speed of light" as speed of causality. The speed of hypercausality (hypertime) is of course infinite from where we sit. The Mach Twins I wrote a little earlier and my research into the Twin Paradox accelerated since. Already you feet I am younger? The mind is ever young! Einstein tracked into relativity via his reading of Mach. Mach said that without a firmament there would be no inertia. And without inertia is there any sense of time? Newton's laws of motion I'm nit-picking, I know, but actually, this isn't the best example to use, because it can be said that his laws HAVE weakened over time. Because at the time he discovered them, they were considered absolute. Einstein demonstrated that they are NOT absolute, and that they break down at speeds near the speed of light. Relativity theory. Learn it. Live it. Twin paradox Acceleration does not explain twin paradox. Travelling twin could have a very brief and large acceleration while 99% of travel time could be at constant velocity. Another way around acceleration is both twins could start travel together. Short very high aceleration and deceleration for both. Only difference being stay home turns around immediately while travelling twin say travels for one yr. By design aceleration of both is same. They differ only in time spent by Travelling twin at high velocity. The problem is same as the difference between rotating and non rotating body. Rotating body can be immediately recognized by outward acceleration while a non rotating body cannot. So my friend the problem is not so simply explained away. Many textbooks unfortunately try to use acceleration to explain twin paradox. It cannot be done. I have come to the same conclusion about 2 times --absolute(Spiritual) and relative(Measured). This seems to allow for 24 hour days of creation as well as relative times allowing for evolution(not macro) etc. I agree with Jeff about the twin paradox with acceleration resolving the "dilema" described in Tsvi Freeman's discussion" which twin will be older than which? Common logic would dictate that they cannot each be older than the other." Time and Relativity paradox incorrect I am not certain about this, but have thought about the "twin paradox" (Rebbe) before. As far as I know, it is quiet true that the travelling twins will have a different age when they meet. The twin who travelled close to the speed of light would be much younger then the other twin. This is because the moving twin would need to undergo great accelleration in order to reach the high speed required to experience time dialation. It is in this accellerated state that time would appear to slow for him (as viewed by the stationary twin) and time would appear to accellerate for the stationary twin (as viewed by the travelling twin). If the travelling twin returned, he would truly be younger then the other twin. >>Time is simply a measurement. A measurement of ''what'' by ''whom'' and ''how''? Time Why do so many make it so hard? time and creation started together. They also work together. Without one, the other can not exist.